It used to be Sandton and Cape Town. Now it’s Sun City and Cape Town. The venues for the prestigious Investment Forum, that is. Held twice a year, the Investment Forum brings together South Africa’s top investment officers and portfolio managers. Securing this conference is feather in the cap of Sun City, and the North West. Even when a conference was held in Cape Town, as the Texas Symposium on Relativistic Astrophysics was in December 2017, the committee organising the conference was led by a North Wester, Professor Markus Bottcher! Another big event for the events industry in the North West province was the announcement that the SAFTAS, the South African Film and Television Awards, would also be held for the first time at Sun City in 2017. Sun International’s recent investment in its conference facilities at Sun City involved upgrades, expansion and investment in more environmentally friendly technologies. Venues available for hire range from a 12-seater Council Room to the Superbowl which can accommodate 6 000, and just about everything in between. No fewer than five types of accommodation support the conference and events side of things at Sun City. There are two five-star hotels (The Palace of the Lost City and the Cascades hotel), the four-star Soho hotel and Casino, the Cabanas hotel (three-star) and the Sun Vacation Club, a self-catering option. The Sun City resort adjacent to the Pilanesberg National Park and Game Reserve is the province’s biggest and best-known conference venue but Tourism North West, the province’s tourism agency, lists on its website a range of venues from small guesthouses with conference facilities in towns such as Rustenburg and Brits to lodges on the banks of the Hartbeespoort Dam. In the provincial capital, Mahikeng, there are several options: among them are the Mmbatho Palms Hotel Casino Convention Resort, which is part of the Peermont group, which has hotels and casinos in six of South Africa’s provinces. The Mmabatho Palms offers eight gaming tables and slot machines. Gaming is controlled in South Africa and licences are restricted to certain operators. The Gambling Board falls under the provincial Department of Economy and Enterprise Development and it has approved 262 Limited Pay-out Machines and six new bingo operations. 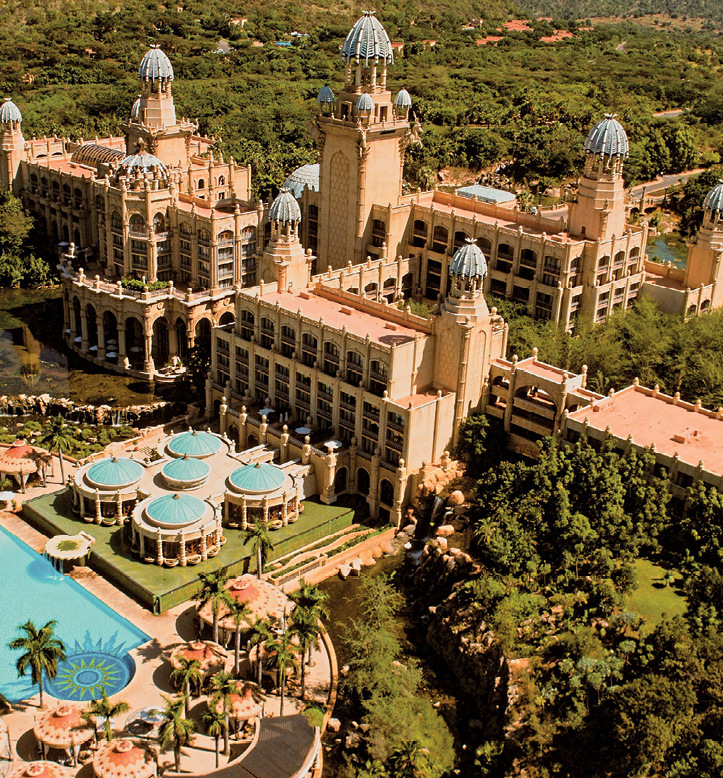 North West’s other casinos are at Sun City and the Morula Casino and Hotel at Mabopane (both run by Sun International) and Klerksdorp (Rio Hotel Casino and Convention Resort), another Peermont property. The North West Parks and Tourism Board is unique in South Africa in that it is the only provincial government entity that runs a hotel school. The Institute of Hotel and Tourism Management (IHTM) has two campuses, one in Mahikeng and one at Ga-Runkuwa outside Pretoria. The courses offered are approved by the Council for Higher Education and accredited with the relevant sector authority, THETA. Another institution that gives the North West province additional weight when it comes to the tourism sector is the Faculty of Economic and Management Sciences at the North West University, where Tourism Management is a popular course and the professors and researchers are at the top of their profession. Prof Melville Saayman is often quoted in the national media when tourism issues are discussed, the result of a number of research papers and documents produced by units within the university department. The establishment of a specialised research unit on tourism came about in the 1980’s. Several name changes later, and with the support of the National Research Foundation (NRF), TREES (Tourism Research in Economics, Environs and Society) came into existence as a research unit in 2015. Apart from published research, which makes decision-making for business and government a good deal better, the unit supports post-graduate studies in the field of tourism. TREES aims to extend its links to the international tourism research community. Three tourism strategies (Culture and Heritage; Events and an over-arching regional strategy) inform what the Premier of North West has called the Arts, Culture and Tourism (ACT) developmental agenda for the province. In keeping with an emphasis on developing the economies of small towns and rural areas, a Rural and Social Tourism strategy is to be charted. The Department of Tourism in the North West has hosted a public meeting in the Bojanala District where discussions were held about the way forward for tourism in the province. There is a strong belief that the industry can become a major creator of jobs and wealth within communities, if the correct strategies and products are developed. Among other provincial plans is a publication to be produced by the Department of Tourism to market the province, particularly to attract potential tourists in SADC countries, in other parts of Africa and in BRICS countries like China, India, Russia and Brazil. Related to the SADC theme is a scheme to develop trans-national routes that would include sites such as Victoria Falls in Zimbabwe. Direct flights are being contemplated to BRICS countries. The Mahika-Mahikeng Cultural Festival is expected to grow in significance to the regional economy as it expands, having been started in 2015. Arts and culture development centres (Mmabana Centres) are found in three of the province’s districts. Twelve public museums have been identified together with 400 heritage sites as part of a census on the province’s cultural assets. The long and interesting history of the Batswana people provides rich scope for commemorations, memorials, song and dance. Anthropology comes to the fore at Taung, site of the first discovered fossil of Australopithecus africanus. The North West Development Corporation has an investment plan linked to this famous site, involving a museum, hotel and spa resort. The Treasure Route runs along the N12 highway and includes wildlife, cultural, scenic, industrial and environmental tourist attractions. The treasure relates to the gold mines scattered along the route. The Vredefort Dome site (90 km across) is not only a UNESCO World Heritage Site for its significance as the landing site of a meteorite many millions of years ago, but it is also one of the province’s best adventure tourism sites with numerous tour operators and accommodation facilities. Adventure sports is a growing section of the tourism sector. 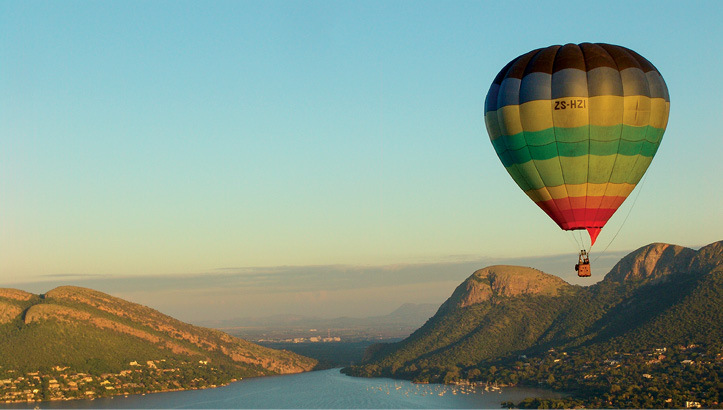 Hot-air ballooning over the Pilanesberg mountains is a popular pursuit, as is quad-biking among the foothills. Canopy tours in the Magaliesberg are on offer, with many opportunities for water sports of every kind on the province’s many water bodies. Hartbeespoort Dam is the biggest of these, but there are ample opportunities for water lovers at Bloemhof Dam, Boskop Dam (north of Potchefstroom) and Vaalkop Dam (north of Brits). Each of these dams has great birdlife, with up to 250 species living at or visiting the dams. Hot-air ballooning over Hartbeespoort Dam. The strategy of the North West Parks and Tourism Board (NWPTB) includes ramping up investment in the province’s 12 smaller parks with a view to creating jobs in the second economy. This presents an opportunity for private investors to become involved. An investment of R43-million has been made in the Manyane Game Lodge in Mahikeng in partnership with the National Department of Tourism. Another project is an ambitious plan to create a mega-park in the north-western sector of the North West, the Heritage Park. The idea is to link the existing parks of Madikwe (on the Botswana border) and the Pilanesberg National Park (a provincial park). Nearly 20 000ha of land is being prepared for incorporation, which is intended in a later phase to become a transnational park. With much of the targeted land being currently used for marginal cattle farming, it is expected that the transference of this to the potentially more lucrative game-reserve option will bring considerable benefits. Pilanesberg National Park is in a giant extinct volcano complex, said to be the most perfect example of an alkaline ring complex. There are several Stone and Iron Age sites in the park. Because the park is situated in a transition zone between the semi-desert Kalahari and wetter Lowveld (or Bushveld) vegetation regions, many types of flora and fauna occur. As the fourth-largest park in South Africa, Pilansberg covers an area of 55 000 hectares.Madikwe Game Reserve is even bigger, covering 75 000 hectares in the area north of Zeerust. In the Marico River Valley and near the Botswana border, the reserve is home to the Big Five. Experienced tour guides say that Madikwe is an excellent place to see white rhinos. There are 18 luxury game lodges in Madikwe. Royal Madikwe Luxury Safari Residence is a regular winner at the World Luxury Hotel Awards. 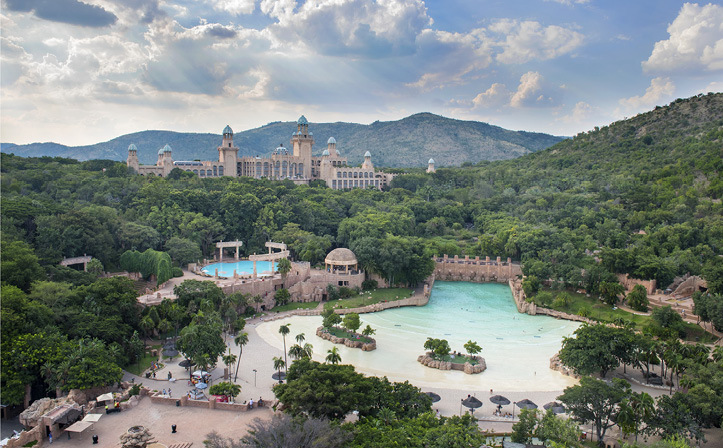 Sun City boasts a unique and holistic offering not found anywhere else in South Africa. An iconic resort, it has so much to offer as a leisure, outdoor sports and conferencing destination. Sun City combines excellent accommodation, conferencing facilities, restaurants and leisure activities in an idyllic setting. It is where water sports and outdoor activities, wildlife, nightlife, golf, adventure, spas, vibrant casinos, four hotels, a vacation club and state-of-the-art conferencing combine in one exquisite location. The resort has prudently crafted its facilities and services to meet today’s business and leisure travellers. Taking its conferencing and conventions offering to the next level is the focus on providing consolidated conference experiences. Companies not only have access to a range of well-equipped meeting rooms and conference venues, but they can also build in morale building and leisure activities into their bespoke conference packages. There are various accommodation options: the three-star Cabanas hotel, four-star Soho hotel, five-star Cascades hotel and The Palace – the epitome of luxury. If you want a no-fuss Sun City holiday with the convenience of self-catering facilities, then you should consider joining Sun Vacation Club or explore our Bush Bungalows – an ideal setting for nature lovers, boasting 14 chalets with an eclectic-style African experience, synonymous with a truly unique Sun City offering. From a food and beverage perspective, various spaces have been transformed to make way for more exciting options and visitors have over 30 restaurants to explore.